Behind sunglasses, Halsted glances at the grandstand filled with thousands of cheering fans, colorful flags, and jangling cowbells. Cameras point in every direction and he catches a glimpse of himself on the jumbotron. Though the Air Force veteran has competed all over the world, the enormity of the event is overwhelming. His eyes turn back to the countdown clock where seconds creep by until the timer suddenly turns green and begins to beep. With an intense burst of energy, Halsted pushes off. PyeongChang marks the north Idaho resident’s third Paralympic Winter Games where he has excelled in Nordic skiing and biathlon since 2010. Throughout his journey, Halsted not only represented the United States in international competition but emerged as a role model and national advocate for adaptive sports, especially for those with disabilities in the greater Spokane area. It could have been a story of heartbreak rather than adventure had he not found the strength and courage, 20 years ago, to persevere after a devastating injury. The year was 1998 and Halsted was enlisted with the U.S. Air Force Special Ops Combat Control unit, an elite team of highly-trained soldiers who support military missions around the globe, including those in remote and hostile areas. “The accident happened during regular training to keep up our skills,” he recalls. “We were just practicing a search and rescue exercise. The insertion we used was fast roping, a technique where troops descend from the helicopter on a thick rope. Lying paralyzed on the ground, his first thoughts were of failure. “For a while, it was the worst thing to rehash that. It tore me up,” he says. “You’re supposed to get from the helicopter to the ground successfully, to be inserted on the ground. You’re not supposed to fall. “Being a veteran, I’m fortunate as I have a lot of people willing to help me. The Seattle Veterans Administration Hospital helped me learn to drive, take the bus…and cook food in my own apartment without burning myself. New doors began to open for Halsted when he attended the 2001 National Disabled Veterans Winter Sports Clinic in Colorado. There, welcomed by a large enthusiastic community, he began competing in adaptive alpine and Nordic skiing, sled hockey, shooting, and other events. He returned to Seattle inspired and ready for more competition but says it was a struggle to connect the dots. Since he was already taking part in wheelchair racing and basketball at the VA, he planned to continue with that. Volunteers and therapists, however, pushed him further. “They told me, ‘You need to pick a sport and go to the Paralympics,’” he says. As a teen, Halsted had loved alpine skiing at Schweitzer Mountain Resort, so he decided to try an adaptive sit-ski. Though exhilarating, he found it awkward to navigate the chairlift and missed the lactic acid burn he used to get with standing skis. He’d done a little cross-country skiing in the past, so half-heartedly gave the sport another go. With surprise, he discovered a knack for it and the arm motion gave him the exercise burn he craved. It wasn’t long before he was tearing up the slopes. Through trial and error, he slowly prepared for national competition, including weaning himself off the opioid painkillers he’d been taking for years, an often difficult task. By 2010, Halsted was competing in the Vancouver Winter Paralympics as part of the U.S. Ski Team. During that time, he was the number two adaptive Nordic skier for the United States with an overall top finishing spot of seventh place. He’d also become a regular on the World Cup circuit where he finished sixteenth in overall standings his first full year on the team. The biathlon was gaining popularity at the time, so he soon added a rifle to his equipment list. 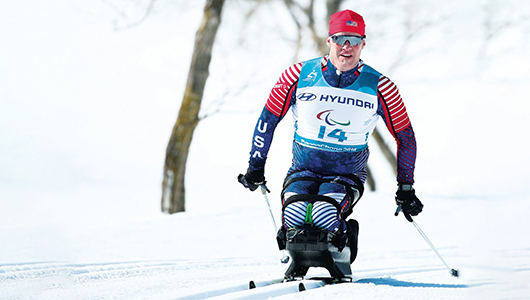 His successful run continued through the 2014 Sochi Winter Paralympics and by 2018, Halsted was a well-known personality in the world of adaptive sports. Though no longer a top competitor, he says he went to PyeongChang to help promote the Paralympics. Looking back at his 15K cross-country skiing race in PyeongChang, Halsted says, “I loved my efforts, felt great about the energy I put into it, but like always for me, you can immediately see the results as you cross the finish line, and start comparing it to your times at Vancouver, Sochi, and world cups. Halsted, husband and father of three, says his primary goal today is to create awareness and community for wheelchair athletes. “Over the years, so many civilians have come up to me and said they didn’t even know these sports existed, and they wish they’d known about them before,” he says. “In Spokane, we have Team St. Luke’s and Parasports Spokane. It’s a great pipeline for kids to get into sports especially wheelchair basketball and track and field. In a bid to keep more wheelchair athletes in Spokane, Halsted is working with Team St. Luke’s and Parasports Spokane to develop competitive wheelchair basketball and track and field teams. The group is proposing that Eastern Washington University provide scholarships for varsity wheelchair basketball and eventually other sports. At the same time, Halsted is collaborating with Mt. Spokane Ski and Snowboard Park to provide improved accessibility to the ski lodge and more opportunities for adaptive Nordic skiing and sled hockey. Top photo: Sean Halsted skiing in PyeongChang (Photo Lintao Zhang/Getty).